The exhibition’s title, In the Unreal Air, is suggestive of impossible life. While the first glance has a semblance of normality, it contains an artificiality that eschews the real, creating an invisible substance that could equally support and nurture or spread out to surround and suffocate. A new atmosphere has blown in, and there is a feeling of an altered world where things are transformed, metamorphosed and even the familiar is rendered strange. The phrase is incomplete, no more than a fragment of a sentence. The original context of the phrase has been lost, the words reconfigured and imbued with new meaning in this new frame of reference, just as the objects suspended in the unreal air are looked at through a transmuted filter. In the creation of a painting, images are sourced, transformed and adjusted, and while a close resemblance to the original exists, the nature and context of the painting’s beginning are obscured, leaving only the visible layers of paint as clues to its inception. The beholder is left to discern and untangle the threads of often elusive visual and spatial elements. The absence of indications of scale can produce just such a disconnected, unreal space. Where familiar points of reference that might give clues to an object’s size have deteriorated or even vanished, the image can’t quite be pinned down, and fluctuates in scale in the imagination of the beholder. The painted object seems simultaneously large and small – or at least these two opposing possibilities manifest themselves simultaneously in the viewer’s mind – and this abstracts the reality of the image. A similar sensation is felt when peering into a dark space like a hole or cavern. Beyond the narrow opening, space could extend infinitely, limited only by the outer reaches of the imagination. Or, as we walk amongst trees, we construct the forest from the few trunks and boughs visible to us: as Gull³ put it, ‘how can we not think of the forest as we wander amongst the trees that prevent our seeing it?’ Yet this forest has the potential of being just a few square metres, or a vast expanse; its limits are merely conjectured, a stable reality created from the unknown via the surrounding greenery. The forest exists within our minds as an imagined conceptual reality, and can be discovered in full only when it has been explored thoroughly and intimately. While the forest is a familiar physical entity with easily imaginable limits, a dark opening has the tendency to elude such rigid boundaries and verge towards the infinite. Unable to ever enter the physical space suggested by the image, a painting suspends the moment of apprehension and possibility that is first suggested by a shadowy crevice. Even while the objects in the light surrounding the hole are familiar and locatable, all sense of scale and proportion are lost in the darkness that draws the viewer in. 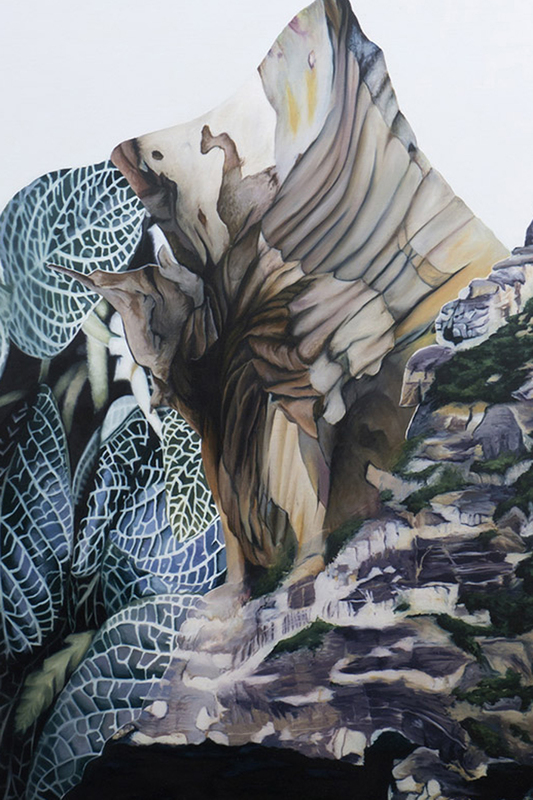 The spaces within these images are ‘natural’ scenes, derived from natural imagery. They bring to mind certain places – a forest, or some dreamlike atmosphere – that facilitate quiet contemplation and reflection, travelling along trains of thought that may not occur in a more everyday, urban setting. These spaces or images may be abstracted or invested with an ineffable quality, creating a strangeness and producing instances when “we are faced with a transformed state of affairs… by gradual unfolding of moments foreboding something unknown or new.” A strange space calls its own nature into question, heightened by the insertion of unfamiliar elements that are not part of everyday experience. Objects that have been distorted, their dynamic shifted, leave the impression that something is amiss. A change occurs, the familiar is exiled, and replaced by discomfort or awe. Nevertheless, these spaces are not impenetrable ‘the air around them unreal but not quite alien’ and while they have a quality that is disorienting, they present an unfamiliar that remains within sight.